Why I chose clicker training to teach my horses which includes my ponies and miniatures about Horse Agility. I found that using clicker training is so beneficial for the agility horses because it is a powerful communication tool. The level of the understanding that my horses have is far beyond anything else I’ve ever used with them. The sound of the click tells them “yes” that is what I am wanting. In the beginning you may have to show them what you want them to do. I’ve found it only takes a few times of showing them something then they start to offer the behavior on their own. When they start to offer the behavior on their own it basically hard wires it into their brain and that tells you that they understand. I love to watch the horses think through the process and offer behaviors as they make me laugh all the time. By using clicker training it builds confidence in the horse and gets them to play an active part in the learning process. All Horse Agility participants start off using the halter and lead but then as they move up the levels they will eventually be working with the horse at liberty sending them around and over different obstacles. For example when going through the starter level Horse Agility course you might encounter things such as having your horse stand with their back feet in a hula hoop while you stand in another one and wait for 5 seconds or you might have to go between two obstacles but have you horse wait before they can come through the obstacle and all of this must be done by keeping a loose lead. No tugging or pulling it’s about communication and clicker training helps you to build that communication. When you get to the liberty level you will have to influence your horse from a distance. One of the tasks is asking your horse to wait at the entrance of the L until you tell them it is ok to go through the obstacle, you are not beside them doing this. 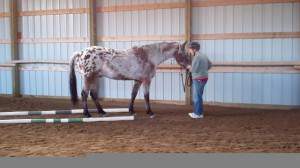 Get signed up for my online classes in Horse Agility using Clicker Training. I also offer lessons at my facility or yours. Call 325-261-3360 or email me today.